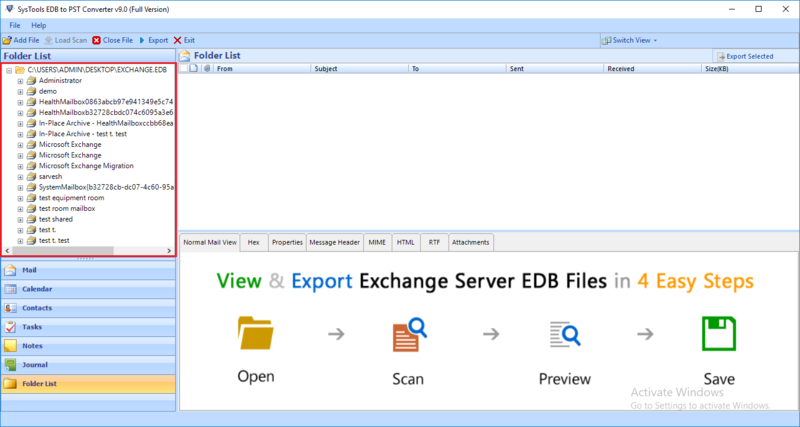 Once the utility completely load EDB file, it shows Exchange mailboxes' items such as emails, contacts, calendars, notes etc. 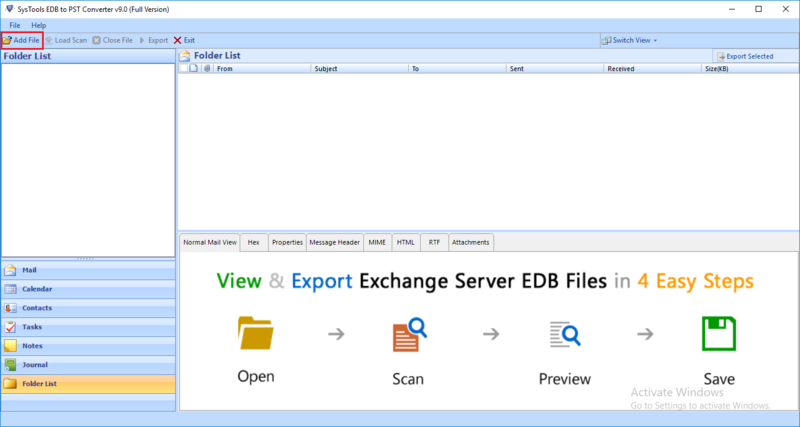 With this tool, users can view multiple Exchange mailboxes at once & export them simultaneously. In addition to batch conversion, Exchange to PST Converter allows users to export desirable emails or other data item to Outlook. You can check/uncheck emails in order to perform selective conversion rather than convert a huge Exchange database. The tool not only convert Exchange to PST but also fix corruption/damaged issues if it finds any. There are two scanning modes; Quick (run by default and fixes minor problems) & Advanced mode (fix fighly corrupted database). The software is a standalone application which doesn't require Exchange Server to be in an active state. 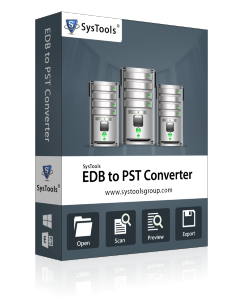 It can export dismounted or offline EDB files to Outlook PST without Exchange environment in the machine where the tool is running. MS Exchange to Outlook Converter provides easy to use graphical interface which makes the tool easily understandable by technical as well as non-technical users. Users can run the software by following on-screen instructions since the utility has self descriptive steps. One of the best feature of the tool is that it enables users to browse destination location to save the data. You can also create a new folder to store exported mailboxes's emails, calendars etc on the local storage so that it can easily be accessible. The utility doesn't alter the originality of the file while exporting Exchange to Outlook. The output it produces in PST format maintained folder structure & attributes similar to input EDB file. Hence, you can perform migration process without any loss of data. The tool has a powerful PST split option which is used to split large resultant PST format according to size. If input EDB is large in size, users can split output file into multiple small-sized files so as to make the resultant file manageable. Once the export process gets completed, an export report is generated by the tool containing two tabs with selected mailbox name & its exported PST path. Further, Microsoft Exchange Server to Outlook Converter allows users to save the report in CSV format. 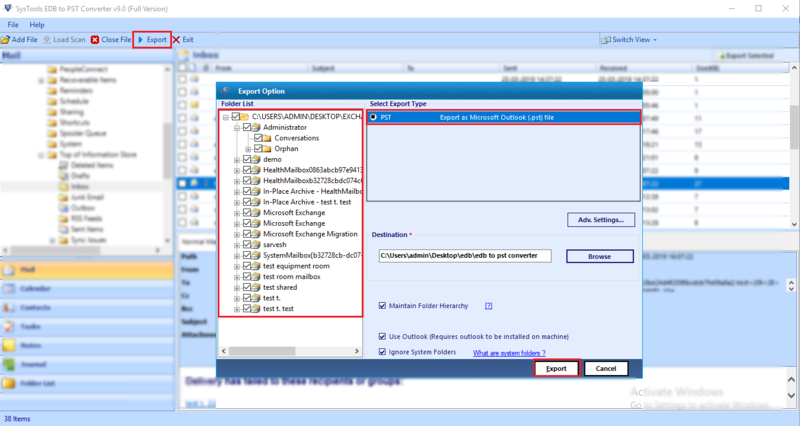 One can try free version of the tool to export exchange to pst outlook before purchasing the complete version so as to know potential of the utility. 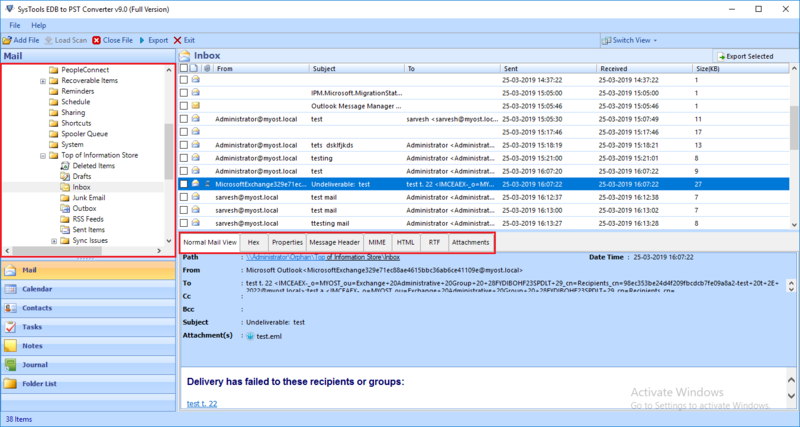 Demo Limitation: Export 25 items per folder from Microsoft Exchange server to Outlook. To be honest, this tool turned out to be the best tool for converting data from Exchange to Outlook. I was capable of performing conversion without any data loss. It's worth trying the tool! Thanks Team. I had an edb file on my system but didn't have Exchange environment so couldn't access it. However, I had an Outlook installed on my machine. Luckily, I got your Exchange Server to Outlook Converter which helped me out in converting EDB file to PST and make it accessible for me. Highly recommended tool.